Have you ever wondered why marijuana is usually dried and cured before being smoked or baked into edibles? The reason is to turn the non-psychoactive THCA into THC. THCA, the precursor to THC, is naturally found in the live cannabis plant and its fresh harvest. But though THCA stands for tetrahydrocannabinol acid, it is not quite as trippy as it sounds. THCA is a non-psychoactive cannabinoid that turned into THC after a process called decarboxylation – a fancy word for what happens when you smoke a joint. As you already know, THC is the chemical compound that gives you a euphoric high when you smoke or ingest weed. THCA, on the other hand, does not have this high-inducing effect, but it is known for other powerful therapeutic benefits, as it is the most potent cannabinoid found in marijuana. Differences between lab-reporting methods can often cause confusion on the potency of THC vs THCA; but by knowing the difference between these two chemical compounds, you can better understand what to expect when you shop from a dispensary. Existing research on THCA has supported the cannabinoid’s powerful medicinal benefits. For centuries marijuana has been recognized for its medicinal potential, and in recent years medical marijuana has been legalized in several states in the US. THCA is the cannabinoid found in the living cannabis plant, and because it exists in a pre-decarboxylated form, it is a more potent version of THC without the psychoactive effects. Anti-inflammatory: it can be used to alleviate swelling from a wide range of illnesses and diseases like arthritis and lupus. Neuroprotective: can protect against neurodegenerative diseases like Parkinson’s and Alzheimer’s. Antiemetic (anti-vomiting): can be used to treat nausea, vomiting, and apatite loss. Antiproliferative: has shown anti-proliferative properties, like fighting against prostate cancer. In addition, THCA can inhibit the COX-1 and COX-2 enzymes that cause inflammation in colon cell cultures. More research on the benefits of THCA could uncover other benefits of the cannabinoid as scientists continue to study the compound in the future. As previously mentioned, THCA is simply the precursor to THC. This non-psychoactive cannabinoid is found in living cannabis plants, and it naturally turns into THC after it has been harvested. This conversion process can be sped up however if the marijuana is exposed to heat, light, or vaporization. This change is due to a process called decarboxylation, which affects the carboxyl groups of the cannabinoid. As soon as you smoke, cook, vaporize, or dry cannabis, it loses the carboxyl along with as much as 30% of its mass. The main difference between THCA and THC are the psychoactive effects. If you are looking to achieve a high, only THC can accomplish that. In fact, most marijuana users only ever experience the effects of THC because THCA is only present in fresh and raw cannabis blossoms. If you’ve ever smoked, cooked, or vaped marijuana then you’ve experienced the effects of THC. However, though THCA and THC are different forms of the same cannabinoid, the difference between them can cause confusion when it comes to lab testing results. In the United States, marijuana that is sold in dispensaries must be lab-tested by law for purity and potency. However, though this testing is a requirement, it has not been standardized, causing some confusion when different labs use different methods. Two of the most common methods, however, are high-performance liquid chromatography (HPLC) and gas chromatography (GC). 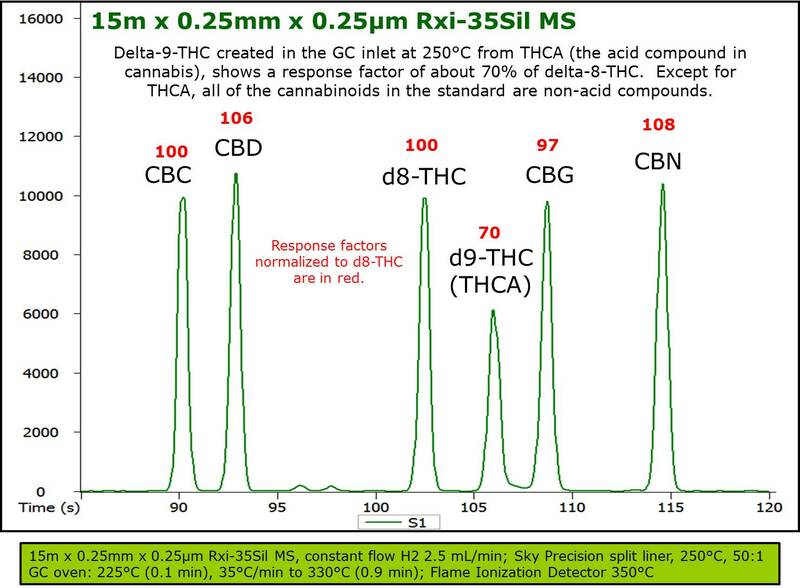 With gas chromatography, heat is used to decarboxylate the THCA found in the marijuana strand to THC so that the psychoactive values can be reported as a reflection of the strain’s potency. However, this method has been found to be unreliable as studies have shown that as much as 70% of the THCA is not converted into THC during the gas chromatography method. This means, that when you smoke, cook, or vaporize the cannabis, you may experience greater effects than the lab reported potency would have implied. The other method of lab reporting, high-performance liquid chromatography (HPLC), tries to eliminate the discrepancy caused by the GC method, by using a more refined formula. With this system, the lab can consider both the levels of THC and THCA. 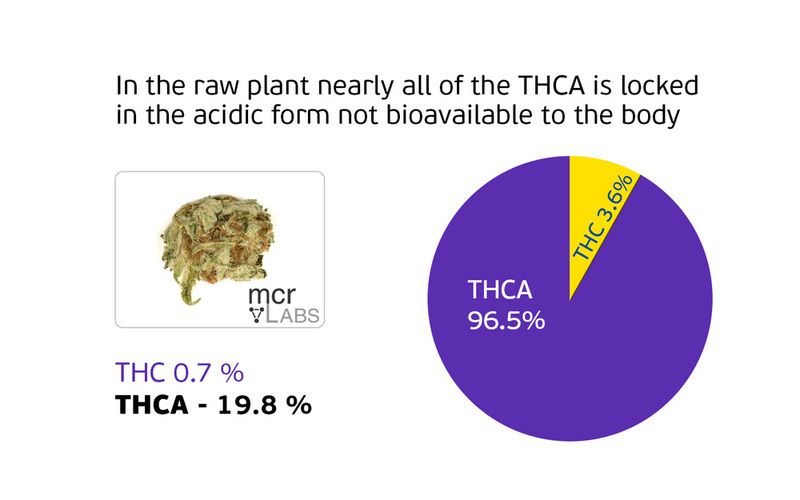 The commonly used formula for this method is: (%THCA) x 0.877 + (%THC) = THC Total. This method offers a more accurate representation of the cannabis flower’s actual potency. In other cases, the entire amount of THCA may be wrongly reported at THC potency by a lab under the presumption that the cannabis will be smoked, vaporized, or combusted anyways. Even if it is going to be used for this purpose, however, it is likely there will always be leftover quantities of THCA that do not convert and therefore do not add to the psychoactive effects. For this reason, this type of reporting is very misleading and inaccurate, and you should always be cognizant of the reporting method used when purchasing cannabis from a lab tested dispensary. Is THCA or THC Better? Whether THC or THCA is better, depends on your individual preferences and needs. If you are looking to achieve a high, then you will need to consume THC. If on the other hand, you are using cannabis for medical purposes, it may be better for you to consume THCA depending on your needs. Many who want to take advantage of the potent effects of THCA juice freshly harvested cannabis flower and plant matter so that they can tap into the cannabinoid’s raw power. However, many benefit from the medicinal potential of THC’s psychoactive effects as well, say for example to combat anxiety and pain. Regardless of whether you are looking to achieve a high with THC or take advantage of the medicinal properties of THCA, it is important to be aware of the discrepancies between labs in their reporting when you shop for cannabis at a dispensary.